What is Lara & Ollie and why did you set it up? We met through our local NCT class and our children were the inspiration behind our business. 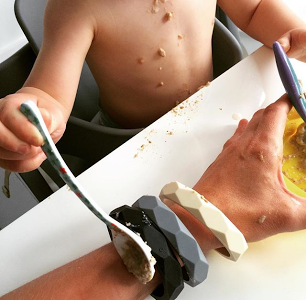 We both love jewellery and accessories but quickly realised when we became mums that it would all be hidden away and would only come out when the babies were asleep. Having made jewellery for fun, a few years back, we loved the concept of teething necklaces. So we made ourselves a few with designs and colours we loved. We had amazing feedback from friends as well as mums who we were getting to know locally – all of whom wanted to know where they could buy them. So we thought why don’t we give it a go. And here we are! We have a successful range of necklaces selling on Etsy and through some shops locally and online. And we’re about to add bangles and a new bead shape to our range. We tend to work when our babies sleep, so have been militant about building a good day time sleep routine for our little ones. The minute they’re in bed, we’re working. But of course throughout the day we’re taking calls, on email and social media – we’ve become masters of pushing a buggy whilst emailing/texting/posting! And our kids are best mates so they are happy running around whilst we follow and chat at the same time. The reality of working for yourself also means we work evenings and weekends too. Daddy day care gets booked in on a Saturday and we’ll get together or go to a fair or event. We generally tend to forego day to day life admin – and we’re lucky that our husbands are hugely supportive and understanding. Piles of washing get ignored and cooking dinner becomes another takeaway! It is however difficult to switch off. And sometimes the most important thing is to take time away from the iPad/iPhone and not talk about the business. It’s all consuming – in a good way – but often the best ideas come when you’re not thinking! We’re lucky as we have each other so we can spread the work load, share the pain and go away without feeling worried or guilty. Through the ups and downs that come with starting up a business we have each other for support and motivation and the ability to talk through a tricky situation. Also our product is relatively straightforward. We design our necklaces and hand make them ourselves and this is done in front of the TV at night. Our supply chain is simple, as are our sales channels, and because we (and our customers) wear the jewellery out and about the word of mouth is incredible. We’ve both lived in the Hither Green and Lee area for 6 years but before then were in Blackheath and Beckenham, so whilst neither of us grew up here, SE London is very much our home. We’ve both found that since becoming mums in the area, we’ve got to know it so much better. There’s a wonderful sense of community here and we’ve made so many new friends, not only through baby classes, groups etc., but just being out and about and chatting to other mums. We walk everywhere – and as with most places in London – we’re walking distance from anything and everything we could ever need. But if we do venture out (not often!) the transport links are amazing. There’s a real sense of space here and the facilities for kids are brilliant – we have about 5 play parks close by, not to mention the amazing Blackheath and Greenwich Park. What has also become apparent is the talent in SE London. We’ve met so many fellow entrepreneurs (or mumpreneurs as we often get called) so sharing wisdom and getting to know them has been brilliant. It’s not much of a secret any more but we’re part of an amazing Facebook group called Mummy's Gin Fund. It was set up by an incredible local mum who wanted to sell some kid’s stuff and there are now over 5,000 mums locally on there. Firstly it’s great for buying/selling anything child related, secondly it’s a huge support when you have a question, worry or issue – the Gin Funders are always there for you 24 hours a day. And thirdly, we’ve received amazing feedback and support for our business from the group so we owe some of our success so far to the mummies of the Gin Fund! There’s also the most gorgeous kids shop at Blackheath Standard called Ottie and the Bea. Get your credit card ready if you go – you will not come out of there empty handed – and they do lovely crafty events for kids. You can find Lesley and Anna at their Lara & Ollie Website / Etsy Shop / Twitter/ Instagram and Pinterest. They are kindly offering a discount of 10% for those in the Mamahood. Simply enter the code MAMAHOOD at the checkout on Etsy. They will also be holding a pop-up event in the gorgeous lifestyle store West Elm next Saturday 1st August at their UK Flagship store on Tottenham Court Road. Between 11am - 5pm they will be in their stylish Market Place offering people the chance to design their own necklaces, choose their beads - colours and quantity - plus select one or more of our gorgeous new matching bangles that arrived this week. They are offering special West Elm prices on the day too.